Why these stocks broke away from the broader market on Thursday. 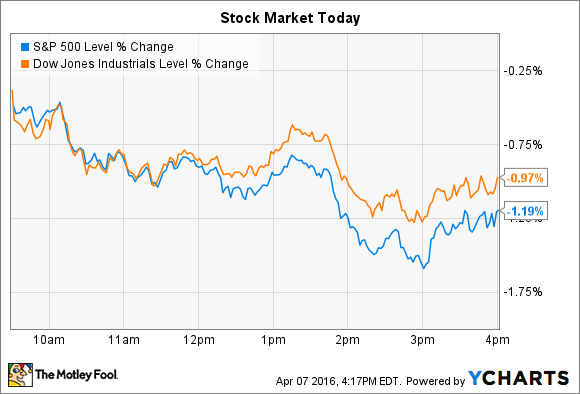 Stocks took a step back on Thursday. Indexes opened in negative territory, and selling pressure didn't let up throughout the trading session. By the closing bell, the Dow Jones Industrial Average (DJINDICES:^DJI) had lost 174 points, or 1%, and the S&P 500 (SNPINDEX:^GSPC) shed 25 points, or 1.2%. That move pushed the S&P back into negative territory for the year, while the Dow is still up slightly. Financial stocks led indexes lower ahead of their quarterly earnings reports, which are due to begin posting next week. Meanwhile, individual stocks making notable moves included CarMax (NYSE:KMX) and Wynn Resorts (NASDAQ:WYNN). Automobile retailer CarMax was one of the worst-performing stocks on the S&P 500, falling 7% after posting fourth-quarter earnings results. The top and bottom lines both beat expectations, as sales and earnings per share each rose 6%. Yet there wasn't much evidence of improvement in the soft selling conditions that have hampered the business during the last year. Used vehicle sales rose by less than 1%, marking just a minor uptick from the prior-quarter's 1% decline. CarMax squeezed less profit from each used car sale, too: Gross profit margin declined to 10.6% from 11.1% a year ago. "We faced a somewhat more challenging sales environment in the second half of the year," CEO Tom Folliard said in a press release, but "we delivered solid revenue and EPS growth... we opened a record number of stores, and we made progress toward optimizing our capital structure by buying back 16.3 million shares." Investors can expect similar trends to shape the new fiscal year. CarMax plans to open 15 new stores, including brand new markets like Albany, NY and El Paso, TX. Continued spending on stock buybacks should keep EPS rising even if net income declines due to falling profitability, as it did this quarter. There will be a management transition in the next few months, as well, because Folliard has said he will retire before the end of 2016 to be replaced by company president Bill Nash. Wynn Resorts bucked the market's down trend by rising 11% today. Investors liked what they heard at the company's analyst presentation Wednesday night, including tentative plans for a new 1,000-room resort property in Las Vegas that will feature a unique recreational lake concept complete with daytime and nighttime entertainment attractions (that guests would pay to access). Concept picture of Wynn's proposed resort. Image source: Wynn Resorts. CEO Steve Wynn described the water concept as "an idyllic beach paradise surrounded by white sand beaches," where guests can water ski, paddle board, or parasail during the day. At night, the lagoon will become the center of a large firework display, the company explained. Management also outlined its plans for bringing down Wynn's significant debt burden during the next few years. A combination of rising earnings and falling debt balances should lower its debt leverage to three times adjusted earnings by 2019, down from almost six times right now. If it can achieve that goal, it would go a long way toward lowering interest expenses, which, at more than $300 million per year, are a huge drag on profits.